Most conductors interpret a composition; some like Julian Kuerti examine, even analyze a subject work. This was evident in his orchestra positioning, erudite commentary to the audience and certainly obvious during his rendering of a smoothly segued Strauss Metamorphosen & the Beethoven Egmont overture. He demonstrated an innate sense of which passages should be accentuated, and selected tempi /pauses for minimizing or exaggerating. The result was dramatic but without musical histrionics. The overture, with its 180° cadence variations is a melodic delight and always a treat for the listener. It’s also a challenge for an orchestra…Kuerti accomplished pleasing both. The post-interval was all Mozart. His three-movement piano concerto no. 27 – the young composer’s final work; was imaginatively & skillfully performed by guest soloist Orion Weiss. Some writers opine that this piece reflected an intuition by the composer of his own impending death. However the opening allegro motif (according to this scribe) is positive – even uplifting. Weiss seems to cherish every individual note regardless of its duration. 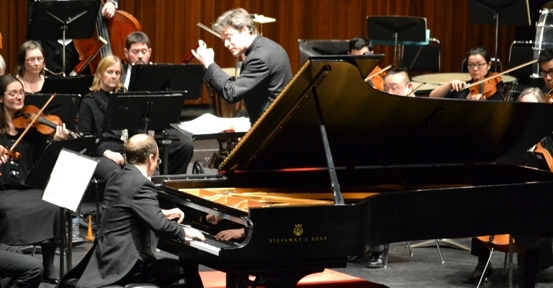 He possesses a formidable right hand that’s every bit as dynamic as a certain Canadian pianist related to the conductor! Weiss appeared to be almost singing along as he performed. The familiar larghetto was given an almost largo treatment that was more deliberate than the composer’s suggested tempo. Impression: – this was a tribute rather than a reading. The lilting and melodic 3rd requires a dialogue between piano and the orchestra. Kuerti took his lead from Weiss, making the HPO musicians more a counterpoint than collaborators. The result was aurally overwhelming earning the soloist a deserved standing ovation and continual applause. The evening’s finale was the Rondo Alla Turca that was rendered with exaggerated spirit and an innovative effervescence. We learned from sources within the HPO that suggestions by individual musicians during rehearsal were received, and then incorporated into the final arrangement. This is the mark of a progressive & unpretentious conductor. Another observation about Julian Kuerti… In his pre-downbeat address to the audience he showed an ability to connect with his listeners with neither patronization nor formality. It was as if he were discussing the upcoming music; interpretations, and rationalization with a few friends. This was a full-fledged symphony concert but with a rare and unusual intimacy. a writer’s perk :- meeting the guest soloist & guest conductor! Some discouraging moments… during intermission; there were discussions by many patrons of this week’s demise of Opera Hamilton. For those of us who are enthusiasts of the arts, the loss of such a cultural local organization hurts. It also diminishes the entire community.